This is certainly something I know about. I moved into a bigger house, and was surprised to find some of the furniture could not be taken up stairs even though we had taken it apart and other furniture just didn’t fit inside the house. The main culprit was a large wardrobe. It would not go upstairs due to a low ceiling and a tight turn. Another was the cabinet which was too wide for the space for the wall with a radiator. Whether it is for your new or old furniture, to know if it will fit, you need to walk the route your furniture will take until you reach your desired room and then, go back and measure to check if your furniture will be able fit through the route. 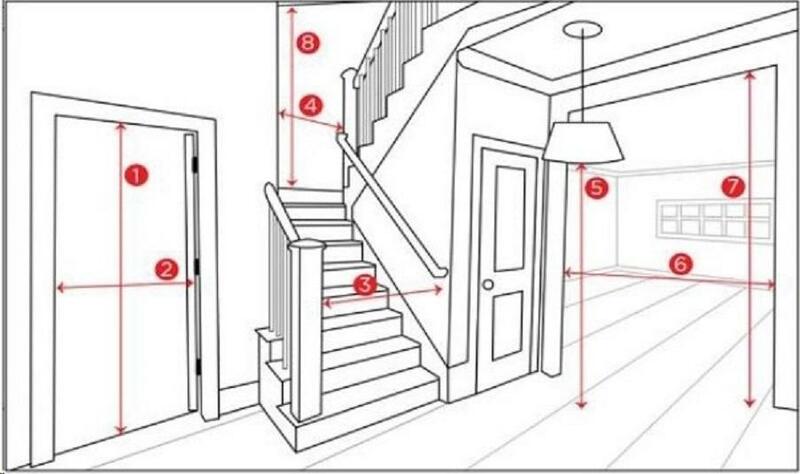 This diagram shows some of the key measures that may be needed to ensure a clear passage for your furniture. With flats or apartments buildings you also have to measure the elevator opening, opposite wall distance and elevator interior height. Finally you need check that your furniture will fit the space it was intended for. Measure the space and try to image the furniture in situ. You can also create your own FREE Floor Plan. If you click on this link: http://www.floorplanner.com you can have hours of fun designing your perfect space. A top tip is to cut out of cardboard, or newspaper a template in the size of your new furniture, or use masking tape to mark off the area on your floor. So simple yet very effective.